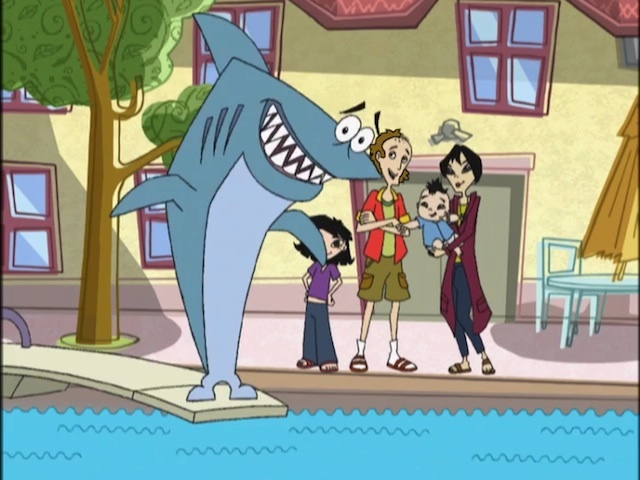 Sharks often make appearances in cartoons. While most of them get generic “Jaws”-like treatments, some get a bit more respect, or even become the main characters. Thus, I thought I’d list some favorite and noteworthy cartoon sharks. While this post was originally written during the famed Discovery Channel “Shark Week,” I’ve since updated it with a few more popular cartoon sharks. Jabberjaw debuted in 1976 on ABC in his own half-hour show. The show was Hanna-Barbera’s attempt to cash in on the 1975 hit movie “Jaws,” and the subsequent shark craze. That said, Jabberjaw took cues from not just “Jaws” (Jabber also being a great white shark), but also other pop culture. His personality and voice were basically Curly of the “Three Stooges.” Jabberjaw’s catch phrase (“no respect!”) was from comedian Rodney Dangerfield. The premise of the show was like that of other Hanna-Barbera shows of the 70s. That is, it’s yet another “Scooby-Doo”/”Josie and the Pussycats” clone. In this case, Jabberjaw was the drummer for “The Neptunes,” a rock band. The band’s members included: generic leader Biff; air-headed Bubbles; cranky Shelly; and Jabber’s easily-excitable, goofy best friend Clamhead. The gang lived in the futuristic year 2076 (100 years after the show’s initial airdate). By this point, Earth’s society was now exclusively living underwater. The aquatic society featured Flintstones-type “aqua”-pun names for various locations: “Aqualaska” instead of Alaska, “Oyster-alia” instead of Australia, etc. The show’s plots usually saw the gang thwart various would-be world-conquering criminals (à la the villains on “Josie”). A musical number of the Neptunes’ played at least once an episode. On DVD: The entire original series is now available on DVD through the Warner Archive program. “Kenny the Shark” ran on NBC and the Discovery Channel during the 2000s. While it was short-lived, I thought this was one of the funnier cartoons to come along during the decade. The show focused on Kenny, a tiger shark who could somehow breathe air, like Jabberjaw. Kenny was the pet (and best friend) of a girl named Kat. Kat was the only human who could talk to Kenny and the show’s other animals, which her parents disbelieved. On DVD: Three single-disc DVDs have been released, collecting part, but not all, of the show’s run. Unfortunately, “Kenny” doesn’t seem to be available on digital video. Even the few DVDs are starting to fall out of print. The other 70s attempt to cash in on “Jaws”‘s popularity was “Misterjaw.” This series debuted on the 1976 DePatie-Freleng produced “Pink Panther and Friends” TV series. 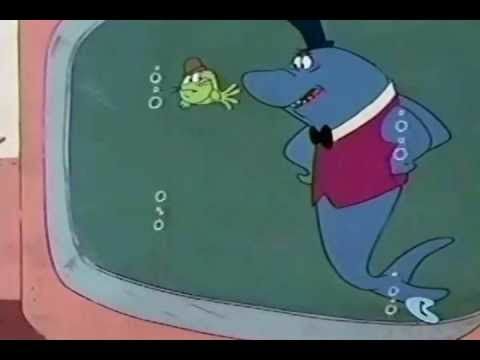 Misterjaw was a great white shark who wore a top hat, vest, and spoke with a mock-German accent. He had a habit of scaring humans for fun. This was by sneaking up on people and yelling “Gotcha!,” causing them to panic. The main supporting character is “Catfish,” Misterjaw’s best friend. On DVD: The shorts aren’t available on DVD or digital video. However, in 2016, plans were announced for a DVD release. This got amplified during this season’s “Total Drama: Revenge of the Island” season. Apparently, part of the “revenge” aspect is the creatures on the island having mutated thanks to toxic waste. One of the recurring sharks had mutated into an air-breathing shark that could walk on land, like Jabberjaw and Kenny. On DVD: The first season of “Total Drama” is available on DVD. Unfortunately, it’s with Cartoon Network’s edits intact, not the original Canadian Teletoon versions. Fortunately, the original Teletoon version’s available through Amazon and iTunes. It’s also available on Netflix. 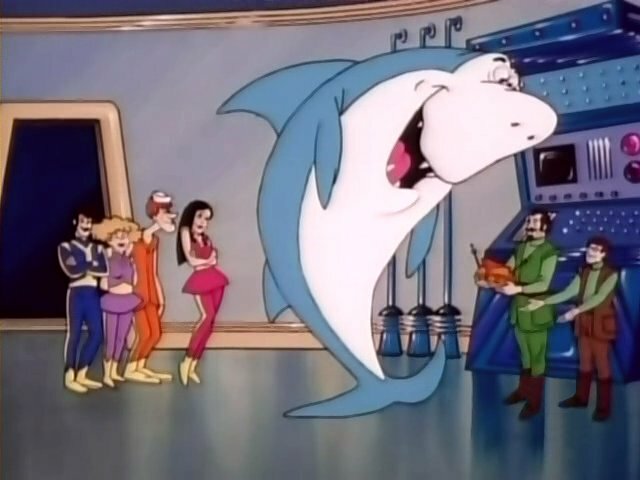 Among the “generic cartoon man-eating sharks” is the one that appears in the opening credits of “The Scooby-Doo Show.” This is the syndicated name for the batch of Scooby-Doo episodes produced in the late 70s. See my post on “The Scooby-Doo/Dynomutt Hour” for more on this show. On DVD: Most of this series’ episodes are available on DVD, albeit in a piecemeal manner. DC’s had a few shark characters. One such character is “The Shark,” a Green Lantern villain. The Shark is a tiger shark that gained sentience/vast mental powers, thanks to exposure to radiation. Similar to the Predator, the Shark’s motivated to hunt prey, but only prey that was a suitable challenge. Thus, the Shark sought out, and ended up clashing with, Green Lantern. Another villainous shark is “King Shark,” a sentient shark that’s supposedly a “Shark God”‘s son. King Shark, keeping with his shark nature (plus the tone of recent DC Comics), is quite bloodthirsty, violent, and vicious. His powers seem to consist of amplified versions of normal shark abilities (super-strength, powerful jaws, etc.). King Shark’s main enemy was the modern version of Superboy. Archie and his pals have tangled with sharks before. This has apparently happened enough times that Archie published a digital collection of their shark-themed stories (“Archie: Shark Tales”). However, their most prominent shark-themed story might be “Archie vs. Sharknado.” Released in July 2015, the story features the Archie gang facing off against the famed “Sharknado” of SyFy channel fame, when a “sharknado” touches down in Riverdale. 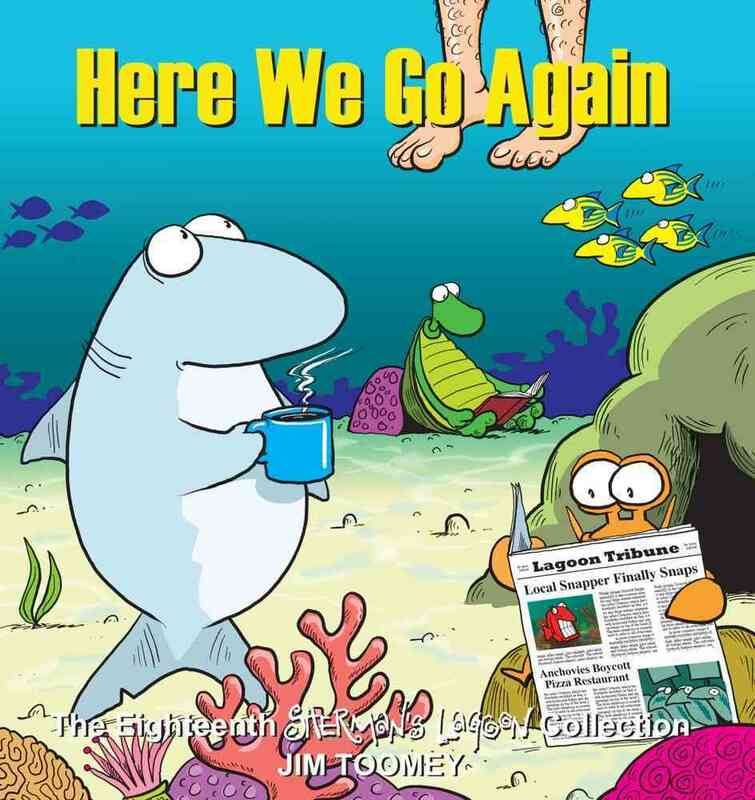 “Sherman’s Lagoon” is a newspaper comic strip by Jim Tooney that debuted in 1991. The strip features the misadventures of Sherman (a lazy overweight shark), his wife, and his various aquatic pals. Despite the strip’s cartoony nature, a few storylines have taken an interest in real-life concerns about sharks. “Shark Week” was once referenced in the strip itself. Sherman made an ill-fated appearance on Shark Week in one storyline. Wow! Nice set of shark cartoons. Really impressive. Does Shark Week always fall in August every year? It seems like Shark Week happens several times a year.